We offer Karate, Kick Boxing, Sai Bo, Women Self Defence, Private Tuition, Brat pack and Karate Kidz. 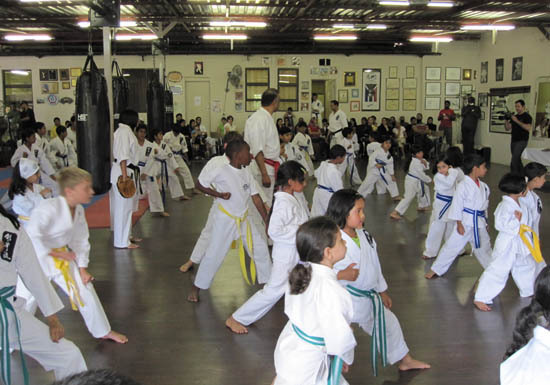 Established in 1965, Said’s karate, kickboxing and Gym is the longest standing Gym and Karate facility in South Africa. Solly Said (Hanshi, 9th DAN Professor PhD MA Sports Medicine, SOKE) is an inductee of The World Multi Martial Arts Hall of Fame. He has worked tirelessly over five decades in order to provide you with the best Fitness and Martial Arts Training anywhere. Professional fitness trainers, martial artists and staff will ensure that your expectations are exceeded and your fitness goals become a reality. Solly Said – Soke, 9th Degree Black belt in Karate and Oriental Weapons Expert, is a rare breed of Master, Practitioner and Master Teacher, known for his amazing rapport with children. His students often train with him from early childhood to adulthood and beyond. Parents regularly voice their gratitude for Soke’s consistent and reliable guidance and support throughout their children’s developmental years. The former is the philosophical name of our organisation and the latter is the ideological name of our Style of Karate. In the world of high-tech, consumerism and fads that sacrifices discipline, honour, patience and quality for quick results, Ken To Fude No Ryu remains loyal to the so called old fashioned values and martial arts traditions from Japan. Essentially a Japanese form of Karate, Kenshu Kai’s lineage is derived from the two mainstreams of Okinawan Karate-Do – ‘Naha-Te’ and ‘Shuri-Te’, which have influenced the Japanese Karate styles of Kyokushinkai and Seido Karate. Hence, Kenshu Kai karate-Do can best be described as eclectic and thus one of the most dynamic styles ever! Special classes for Women only. National & International Tournaments and tours. Workshops on Self-Defence, Jujitsu, Weapons Training, Breaking Techniques, etc! etc! Camps and Retreats to Exotic locations. Special Coaching workshops: Refereeing & Championship Training. We practice Full-Contact, Semi-Contact, Sport Karate and Traditional Karate-Do. You can choose any of the different disciplines that suit you. Ken To Fude No Ryu Kenshu Kai Karate was formed by Grand Master Solly Said 9th (Dan) Degree Black Belt. Soke Solly Said has been involved in the Martial Arts since 1965. ALL COURSES ARE HELD AT A FULLY EQUIPPED CENTRE, AND ENDORSE AND SUPPORT THE PRINCIPLES OF SELF DEFENCE AND FITNESS. WE CONDUCT SELF DEFENCE WORKSHOPS FOR CORPORATE AND PRIVATE GROUPS. THE KANSAI SELF DEFENCE PROGRAM IS FLEXIBLE AND CAN BE STRUCTURED TO SUIT THE INDIVIDUAL OR GROUPS FROM FIVE TO FIFTY. THE PROGRAM CAN ALSO BE STRUCTURED FROM AN INTENSIVE 1 HR TO 12 HOURS, DEPENDING ON THE NEEDS OF THE CLIENT/S. PRIVATE TUITION BY APPOINTMENT ONLY. Call us NOW on 011 888 0217 to find out how you can receive a FREE consultation at Said’s Gym.